Magento evolves every minute and here is yet another major update that has been rolled out focusing on product security and functionality. 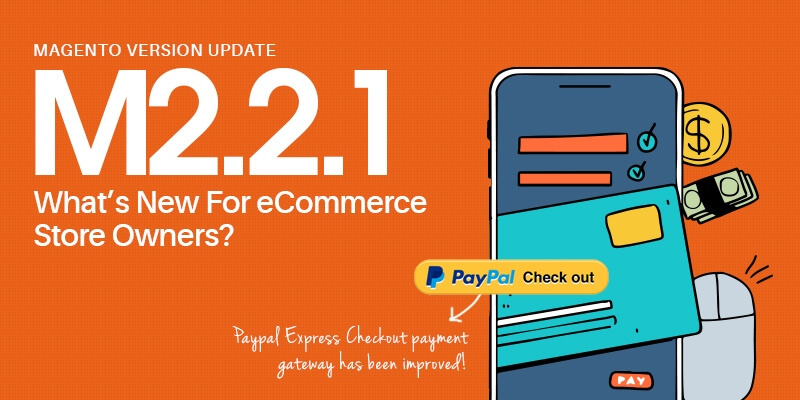 Here is what Magento developers and eCommerce store owners need to know about the new updates. Security updates earn the limelight. The new version is bolted with 15+ security changes which address major issues like cross-site request forgery (CSRF), Cross-Site Scripting (XSS), Local File Inclusion (LFI), Arbitrary File Delete vulnerabilities, data theft or leakage due to unauthorized entries and also vulnerabilities existing in remote code execution for an authenticated admin user. With nearly 40+ functional updates, the new releases hold features contributed by Magento community members as well. Magento Open Source now has the Signifyd Fraud Protection which checks orders for frauds and indicates the ones that need to be shipped and those which shouldn’t be. Signifyd Fraud Protection allows you to automate order reviewing that allows business owners to focus elsewhere. The processing of virtual products by PayPal Express Checkout payment gateway has been improved. With community contribution, the new Magento version has over 22 bug fixes and security enhancements. The price display issue has been fixed so that storefront does not stop showing product prices. Tax calculation and adjustments are made easy as the Lowest Price Options Provider now returns products with the tax_class_id attribute. The lowest price for a simple product will be displayed in grouped product page. Filtered products will now be shown by Magento to a particular store view though the corresponding store view has been deleted. The inappropriate price display that arises in case if a configurable product has two price options has been fixed. Category pages will no longer show configurable products if we turn off the ‘Display out-of-stock products’ settings. Magento will not calculate both child and parent products while calculating the quantity of shipped items. If the configurable product is in a shipment created by REST, the parent quantity alone will be taken into consideration when it comes to the total quantity of shipped items. The order duplication error has been fixed. This error comes up when a user double-clicks the ‘Place Order’ button while using Braintree payment method. If credit card errors occur while using PayPal Express Checkout in a split-database environment, customers can correct the error and successfully create a new order. Customers can now re-enter credit card information and Magento will complete processing an order. Earlier Magento returned an error. The Magento search experience is evolving as it has been updated to return same search results if a customer uses search terms from the same synonym group. New browser tabs will no longer make a difference in search results as same search terms will return same results irrespective of the number of browser tabs used. Well, that completes our highlights. To know more you can visit Magento dev docs. For a full-on Magento experience, it is advisable to download the latest version or migrate to Magento 2. If you need the technical expertise to mediate your move to Magento 2, TheCommerceShop can help you out. We have Magento Migration experts who can get your eCommerce store updated. Have look at our blog on Migration tips and timeline to know more why migrating is mandatory.